I just got back from a week touring around Mexico on a rented Harley Davidson Roak King. This scenario came about when my bike was not allowed to cross into mainland Mexico because of a temporary vehicle import permit snaffu. I decided to salvage the trip by renting the Hog. I rented the bike from PV Cycles in Puerto Vallarta. From there I rode down the coast to Manzanillo. The next day I hit some spectacular coast roads on my way to the next stop: Zihuatanejo. I relaxed in beautiful Villa Carolina for a couple of days. Then it was time to hit the road again. I rode inland to Patzcuaro, a mountain village straight out of the 1500s. I stayed in a centuries-old building called Hotel Posada de la Basilica. In the morning I rode the shores of mist-shrouded Lake Patzcuaro. I stumbled across the ruins of the city of Ihuiatzio, which was the capital of the P’urhepecha kingdom from 1200-1530, although it had been settled since 900. From there I rode through the mountains and rancheros to hook up with the main toll highway leading to Guadalajara from Mexico City. It was wonderful to open up the throttle on the wide smooth 4-laned freeway. I managed to get the King up to 105 mph, but this was on a slight downgrade. The best I ever managed on the flat was 99 mph. I exited after a couple of hundred km so that I could ride the southern shore of Lake Chapala and around to the town of Chapala, where I spent my last night in Mexico. The ride along the south shore of Lake Chapala was a winner with great views of the lake and mountains. I stayed in an English B&B in Chapala that had a proper English garden in the inner courtyard. I also ate a proper English breakfast to set me off for my last day of riding from Chapala over the spectacular Sierra Madre to Puerto Vallarta. A complete set of my Harley Mexico trip photos are posted on flickr. I was lucky enough to spend a week riding in Baja California this past December. My bike had been in storage in San Diego and my plan was to cross into Mexico and ride down to La Paz and take the ferry over to Mazatlan on the mainland. My eventual plan was to ride to Cancun a week at a time. However, after riding for days through the Baja, I ran into a bureaucratic nightmare involving temporary vehicle import permits when I got to La Paz. The bottom line is that I was told I had to go all the way back to Tijuana to get an old permit that expired in 2010 removed from the computer system before a new permit could be issued. A permit is required for mainland Mexico, but not for Baja California. 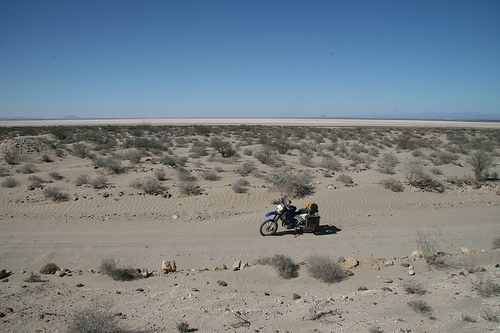 Thus my DRZ400 will remain in storage in Los Barriles in Baja California for the time being. 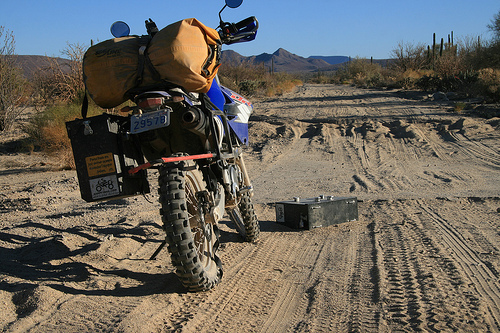 Oh well it gives me an excuse to head back to Baja at some point in the future to retrieve my bike. I had an awesome time there yet again. I rode down to San Felipe on the sea of Cortez from San Diego. From there I headed for Ricardo’s Rice and Beans, the unofficial stopover of the Baja 1000. On this ride I hit rain, wind, and downright cold weather. It was only about 12 degrees Celcius in the mountains. I stopped at a roadside shack for shelter and was surprised that it was non-other than Coco’s Corner of “From Dusk to Glory” fame. Coco is a 77 year old man with both legs amputated below the knees who has been collecting memorabilia from the Baja 1000 race for decades. I signed his guest book and left him a piece of my motorcycle – my windscreen. It was irritating me always coming loose and now it has a happy home. Coco told me the rain I was sheltering from was the first rain in more than 2 years. I eventually made my way to Loreto and then Los Barriles where I relaxed in the beautiful Palmas hotel located next to the beach. I ended up flying home from Los Cabos. Above: Coco’s corner. It is really in the middle of nowhere. It is on a dusty dirt road south of Gonzaga bay. 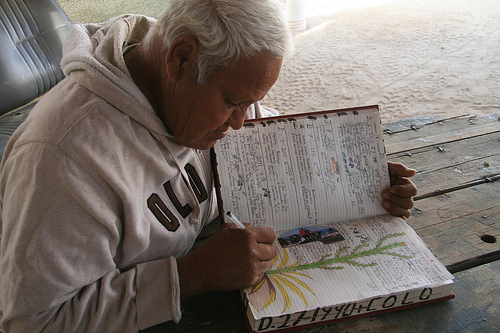 Coco is 77 years old and he says he thinks he will only keep his place open another 10 years or so before he retires. I was lucky enough to run into the first rain in 2 years to hit this part of the Baja. 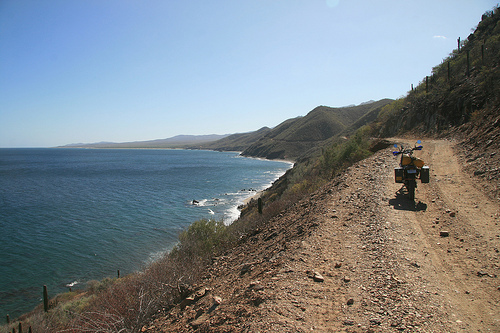 The coastal ride into Los Barriles. For more photos, please see my complete Baja Adventure collection. This video was put together by Pepe Murrieta, a Naturalist Guide from Mexico who co founded Cabo Pulmo National Marine Park. He got me onto a marine biologist expedition to photograph and GPS-tag the whale sharks off the coast of La Paz, Baja California. He had an underwater camera and caught some footage of me swimming with a “juvenile” whale shark, which is “only” about 7 metres long and weighs in at “measly” 7 tonnes. Adults can be more than 12 metres long and weigh more than 20 tonnes. The marine biologists explained that they have visually catalogued 250 separate animals, and that they know a lot of them by name as they come back year after year. Some are easily recognized by the scars and “boat hits” they have sustained. There were at least 15 different animals in the bay during our expedition, and I swam with almost all of them. Their mouths looked so huge that I wondered if they could swallow a human by mistake. At one point, with a huge gaping whale shark mouth approaching from one side and a “flock” of sting rays behind me, I admit I hyperventilated a little. But I have to say that this was one of the highlights of my life. It is right up there with coming face to face with a silverback mountain gorilla in Uganda and staring down and Elephant in Botswana. How many opportunities are there to be a couple feet away from an animal this big? Just don’t call them whales around marine biologists. They are fish. The world’s largest. 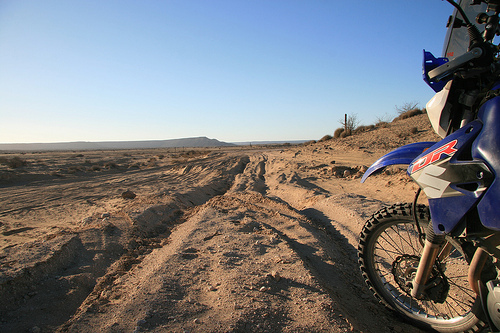 I had such a good ride on my last Baja California adventure that I am planning on going back this December. My DRZ400 is in storage in San Diego. I am going to fly down to San Diego to pick up my bike and then spend a week or so riding back down the Baja. I plan on taking the ferry from La Paz back to the mainland and leaving my bike in Puerto Vallarta while I fly back to Calgary to work for a week. Then I fly back and ride from Puerto Vallarta to Cancun over the Christmas holidays. I will leave my bike in Cancun where it will await my return in February for a proper exploration of the Yucatan peninsula and the Maya ruins. The ride from Puerto Vallarta to Cancun is a 2500+ km ride that I will only have 7 days for. It will be a tight schedule and it is a busy time of year so I have done something that I have never done on these types of trips: I have actually planned out an itinerary and booked hotels in advance along the way. The problem is that this does not allow for much spontaneity or time for punctures, etc. However it will be good to know that I have nice places waiting for me along the way. I plan to ride south along the Pacific coast all the way to Puerto Escondido to avoid the cold in the mountains before heading east. I will post my reviews of the places I stay once I return. I will be a guest at the hotels listed below. Hacienda Alemano is a boutique hotel run by a German/Mexican couple located in the colonial heart of old Puerto Vallarta. Apparently you can get German beer, and the Schnitzel and German sausage has been highly recommended. Day 2: Zihuatanejo. 711 km. This is the town where Andy and Red ultimately escape to at the end of “The Shawshank Redemption”. I will be staying at Villa Carolina guesthouse. Day 3. Puerto Escondido, Oaxaca. 633 km. This is a lovely little town with a fantastic beach that I vowed to return to one day after having ridden through it without stopping on my way from Canada to Argentina while on the Americas trip of 2007. Now I finally get my chance. I will be staying at a bed & breakfast called Villa Lili. Day 4. San Cristobal de las Casas, Chiapas. 618 km. This is a colonial town nestled in the mountains. I will be staying at Casa Felipe Flores (pictured in the bottom image). Day 5. Calakmul Biosphere Reserve, Yucatan Peninsula. 523 km. I had envisioned spending days wandering around the jungle covered Mayan ruins in this area, but alas I will probably only have time to ride down to see Calakmul before moving on. I will have to save the rest of the exploration for the next trip. I will be staying in Hotel Puerta Calakmul, an eco-retreat deep in the jungle of the Calakmul Biosphere Reserve. It is rustic but comfortable according to the reviews, although probably not worth the $170/night. Unfortunately there is nothing else within miles that I can find. There is no internet or cell service. Day 6. Bacular, Quintana Roo. 175 km. I had a difficult time finding anything available in the Mayan Riviera. Not only is almost everything already booked, but there is also usually a 3 or even 5 night minimum stay. I eventually found Hotel Laguna Bacular on the shore of Bacular Lagoon. According to reviews it is showing it’s age but is clean with friendly service. Day 7. Cancun. 342 km. I tried finding a room for one night on the glitzy tourist beaches, but everything was either booked or way too expensive. I resorted to Frommer’s, which has done well for me in the past in Mexico, and they recommended Eco-Hotel Rey Del Caribe in downtown Cancun. It is not on the beach, but apparently they have created an urban oasis with lush courtyards and friendly service right in the heart of the city. Best of all it is reasonably priced. I am still in the process of finding out if I can leave my motorcycle there until I return in February, which would be ideal. Congratulations to my brother Cailen who just got married to Rachael in Victoria. I rode from Calgary to Victoria for the festivities on trusty ol’ Rosa (who now has well over 70,000 km on her) taking the scenic route through Montana, Idaho, and Washington state on the way there. On the way back I took highway 3 through southern BC and Alberta. Ted, of South America and Africa adventure fame, joined me for the first leg of the trip. He had ridden his DRZ400 to Calgary from Chatham, ON. Ted rode with me through the Rockies and over the Logan’s pass in Montana. Even Jeremy of Africa fame and his girlfriend Lisa were able to join us for one day of riding. It was nice to have the three amigos back together if only for a day. Ted continued on through Yellowstone and Mount Rushmore before heading home. It felt so good to be back in the saddle that I wished I could just take off and hit the open road for a few months again. Alas those days are over for now. I have used the GPS tracking information to recreate my route complete with photos, which you can view below. Below are interactive maps of the southern and nothern halves of my trip. 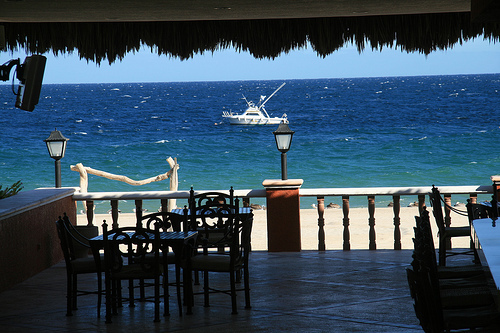 The southern leg started in Cabo San Lucas. From there I rode on tarmac to Loreto on the first day. The next day I rode almost entirely on dirt from Loreto (on the Sea of Cortez) to a whale watching camp on Laguna San Ignacio (on the Pacific side). Because my luggage rack disintegrated and I got lost, I ended up night riding on sandy tracks for several hours before finally making it to the camp. The next day I went whale watching (awesome!) and afterwards limped to San Ignacio where I had my luggage rack welded back together. 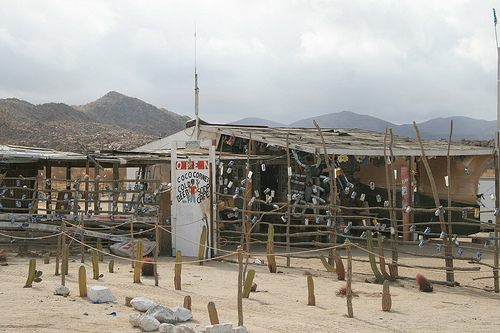 I stayed at Ricardo’s Rice and Beans, which is an unofficial stopover of the Baja 1000. Indeed I met many other enduro riders there, including one guy who split the swingarm on his BMW 650 in two and had to have his bike hauled over 200 km by a local rancher. The next day I rode dirt to Bahia de Los Angelos. This was a fantastic ride recommended by Bruce, one of the riders I met at Ricardo’s. He has been riding the Baja for over 20 years. The next map is the nothern leg of my trip. By this point I was running out of time so I stuck to the pavement. I found an oasis of a hotel called “Jardines” with lush tropical grounds and great food. This was recommended to me by a 70-something year old lady travelling through Mexico with her friend by bus. I met these two spirited ladies at the whale watcher camp. They have travelled throughout Mexico by bus and had many stories of stumbling upon random festivals and hidden towns and their fond experiences of the warmth of the Mexican people. I was lucky to find my bike where I left it in the parking lot of the Finisterra hotel chained to a pipe when I returned to Los Cabos, Mexico on February 5th. I have to admit that once I got back to Canada after leaving it there at the end of my December trip, I began to question the wisdom of my decision to leave my bike in such a precarious situation. However, I needn’t have worried – my DRZ 400 was exactly as I had left it. I had a week of solid warmth and sunshine for my ride up the Baja peninsula to my bike’s next resting place in a secure self-storage facility in San Diego. I guess the warm sunny weather is to be expected in an area that gets at least 350 days of sunshine per year and some regions go for years at a time without rain. 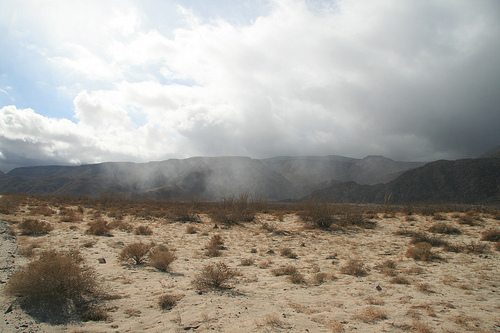 The desert fauna, with its capability to extract moisture from sea mist, was one of the features that made the ride seem otherworldly. 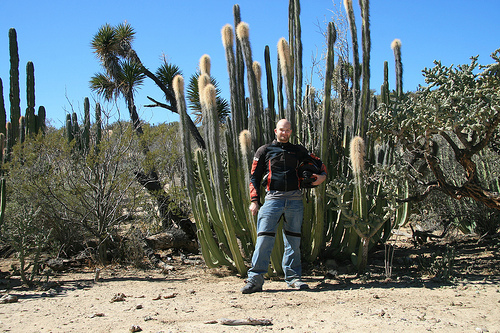 Like Bolivia, if you were to be dropped into the Baja, you might wonder whether you were actually on another planet. The red rock formations and dry riverbeds also added an almost Martian flavour. The fact that you could ride for days without seeing more than a handful of other vehicles, combined with the option of riding anywhere you wanted, makes the Baja one of my favourite rides thus far. The diversity of the terrain from sand dunes to salt flats to single track mountain trails made every day a fun challenge. I was glad I had the benefit of the light DRZ 400 so I could float on the sand and tackle trails made up of toaster sized rocks. I can understand why the Baja 1000 is probably the world’s second greatest off-road race next to the Dakar. Although I am ashamed to admit it, I was not riding crazy enough to drop my bike even once on the this trip. However, the trip was not without its misadventures . On the day I left Loreto with a plan to ride to a whale watching camp on the opposite side of the peninsula, I got lost on a cattle trail in the deep sand at night. I had set off through the mountains which was slower going than I thought. By the time I filled up with gas from a barrel at the only settlement on my route, there was only an hour or so of daylight left to cover 150 km of offroad trails to get the camp (which I had no GPS location for). This might have been possible had my luggage rack not disintegrated from the vibration of the rocky road forcing me to stop several times to tie my falling luggage back onto the bike. I had to ride considerable slower too because of my tenous rack. Also, the terrain got challenging with big pits of fesh-fesh that could easily swallow a DRZ whole. At one point I almost ran through barbed wire gate strung across the road because of the growing darkness. From that point on I was riding blind through soft sand. I kept my speed up and didn’t even realize how deep the sand was until I stopped to check my GPS (not helpful) and almost could not get moving again because the bike sank so much. Finally I saw the lights of a village at Laguna San Ignacio and a local kindly led me to the whale watching camp with his truck. The next day I was able to go on a whale watching tour of the Gray Whale winter calving ground and get my luggage rack welded back together in San Ignacio. There I discovered Ricardo’s Rice and Beans, a hotel and bar that is an unofficial stopover of the Baja 1000. I met a number of other enduro riders there, including a guy who literally broke his BMW 650 in half and had to have a rancher put it in the back of a rusty ol’ truck and drive it 200 km to San Ignacio. Needless to say he needed a shot or two of Tequila. When i arrived in San Diego I decided to store my bike there instead of riding further north because I really want to ride back down through Baja.